Tolerances can be critical in the design stage. Soft flexible and elastic materials often pose a problem; margins are wide and failure can be high (the seal itself is the weakest point). Often designers and engineers look to minimise tolerance and demand consistency in production to prevent gasket failure. 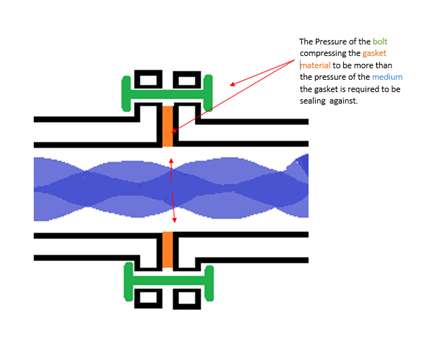 This article seeks to understand the reasons behind tolerances, why they may or may not be important with flexible materials and what factors within gasket dimensions are the most important when designing a seal. Tolerances can be difficult to achieve, you may not need to worry about tolerances being exact. Gasket tolerances are wider than other materials such as metals glass and composites, however this is rarely a problem, rubber has many excellent properties that other materials cannot get close too. It is the very fact that rubber is very hard to cut to exact tolerances that makes it such an excellent seal. It displaces and distorts into every place you are trying to seal whilst retaining volume and density. The tolerance that RAM quotes with most parts. Generally, RAM quotes gaskets at a tolerance of ± 0.5mm. This can seem to some designers/engineers a large margin of error. Below we discuss why this is the case and what can be done when tolerances are critical. How a rubber gasket is creating a seal. To work a gasket must be softer than the flanges and distorted by them. Elastomers are elastic and resilient, displaced not compressed between the surfaces. The material, if a solid rubber retains its density and moves to other areas sealing the gap. The physical dimensions of the gasket purely position the gasket between the flanges. When the gasket is pressurised by the flanges, all the rubber dimensions’ change. The material is distorted within the flange; the rubber component of the material is very important here as this is a material that displaces rather than compresses. Why is rubber displacement so important? Rubber displacement means a larger surface area of the flange is covered when the material is compressed, it is solid and impermeable when in its natural state, when compressed it maintains this whilst the elastic nature of the material allows it to be compressed over a larger surface area. The rubberised compound compresses by the material resisting the force of the flange compression and when it becomes too great it moves to an area of lower pressure, this means the material is still intact and that there is a greater area of flange that is sealed. 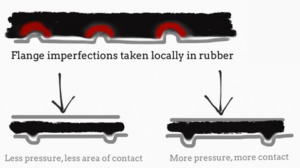 Rubber’s unique friction properties play a part here too. Rubber has a high friction on many surfaces, its low elastic modulus and high internal friction makes for a ‘grippy’ material when subjected to pressure against a harder material. Any areas of stress are consumed ‘locally’ in a rubber, deforming around shapes and imperfections whilst the rest of the material remains in its previous form relative to the amount of pressure applied. If the material is less dense like a softer rubber at room temperature the compression of the flanges will displace the material with more ease. There is a greater chance of over-compression the softer the material, when a material is over-compressed it can be completely squashed out of the flange. How is a foam different and why would I consider a foamed rubber? 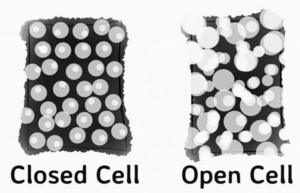 Foamed rubbers are good for areas of lower pressure, rubberised foams used in the gasket industry are closed cell – this means there are fully encapsulated air bubbles in the material and the material itself is not porous as illustrated in the illustration below. The foam allows a low-pressure flange to be tightened and create a seal, there is greater contact area with lower pressure. If the material is over compressed the air bubbles are fully compressed and the material then acts like a rubber once more. In high temperature applications, a rubber can’t be used as it is flammable. Rubber compounds are blended with high temperature fibres, the rubber compound gives some compression whilst the fibres prevent the material from reaching a high enough temperature to burn and melt. Displacement and Compression in high temperature and high pressure applications. Displacement and compression are major factors in creating a seal however in high temperature, high chemical and high pressure environments, (sometimes all three) other material alternatives must be considered. The design of the flange is often around encapsulating a gasket or material to withstand the pressure such as the use of spirally wound gaskets within a specially designed pipe flange. There are many different types of material for all applications. Use RAM’s technical support (contact form) to decide on a material type. Dimension changes when fitting the seal. From the information above you can see how many dimensions change when gaskets are utilised for sealing, this shows how tolerance on the original cut part can have little impact on the final compression place of a gasket. A tolerance of ±0.5mm is sufficient for nearly all applications. Tolerance of Gasket Sheet Materials before cutting. The gasket materials themselves are only produced within a range. For a sheet material Hardness is +/- 5 SH for instance. The centre of a sheet of material will have a different thickness and hardness reading to the edges of the material. Thickness of the materials also has a quite wide tolerance before you even begin cutting. Cutting flexible gasket materials and how this further effects tolerance. The material moves away from the cutter before it is cut and recovers to a different dimension after it is cut. This varies between type and thickness of material and changes with the features and dimensions of the gasket, e.g. two holes close together or a thin flange will have a bigger distortion than another area of the gasket. The method of cutting also changes the way the material behaves. a profile cutter will produce a slightly spiral hole with a step between start and finish and a taper between top and bottom. A press cut component will have an apple core profile with a waisted area half way down the hole. The dimensions will be different between the top, bottom and middle of the hole. So, how do I measure a gasket? Firstly, different people using the same equipment will get different results. Optical measuring will find the absolute minimum or maximum dimension while a Vernier will generally distort the material a little before the measurement is taken. A go/no-go gauge will generally give an oversize measurement as it pushes through. When designing a gasket, a 20mm bolt will get a 22mm clearance hole in the gasket. The flange will usually be 3mm or so bigger than the gasket so that when it is tightened on the gasket the gasket edge expands outwards to the edge of the flange, rather than sticking out beyond it. However, this effect can be used to grip the sides of a bolt or a screw for instance. How did you measure your gasket? It is important to consider how you have measured your component. Have you measured the flange face or an old gasket, for example? If you measure the same dimension 20 times you will get a spread of results, so the measurement itself is only accurate within a range say +/- 0.25mm. Did you measure the top, middle or bottom of a hole? 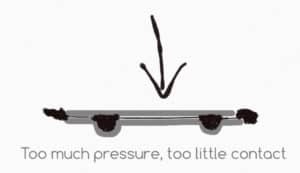 Simply laying a gasket on a flat surface, the surface friction can hold a dimension bigger or smaller. If the gaskets are made from rubber foam then this variation can be several mm. The measurement intention is to establish the effective surface area of the gasket, but you can only measure its dimensions. The outcome of accurate measurement is that the gasket will sit on the flange, the bolts will fit through the holes, the surfaces of the flanges will press against the surfaces of the gasket, distorting the gasket and building up a pressure which is greater than the environment you want to seal against. What is the tightest tolerance that can be achieved? The tightest tolerance a rubber can hold is around +/- 0.2mm. This requires mould tooling which is a huge initial investment where the relative precision gained must be important to warrant the overhead and long lead times involved. Change a dimension even by 0.5mm and you start the whole process again. It is only suitable where the part has features in the third dimension and the volumes are high enough to spread the cost of the tool. RAM can provide moulded parts, tighter tolerances and individual conformance checks on each part if required. A gasket does not behave like metal, it can’t be cut thinly or machined like a shim, it does not have finishing operations like grinding and polishing. It works because its dimensions are vague and it changes its shape under pressure. It adjusts for changes in temperature and pressure, expansion and contraction, absorbs vibration and dampens oscillations protecting the metal parts which are too rigid and precise to allow this variation. What tolerance does RAM provide for rubber based gaskets and seals? We quote a tolerance of +/- 0.5mm for our gaskets. Most dimensions fall within this tolerance. In some cases, a special tolerance has to be specified which is particular to a part. Or a part has a critical dimension which can be catered for usually with a looser tolerance somewhere else. What tolerance should I put on my drawing? RAM knows you need to put tolerances on the drawing, that they are important to metal parts fitting together. 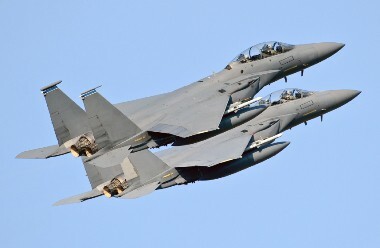 But they are not to the gasket. Each one must be considered separately. A complicated hydraulic face seal is different to a 500mm NB pipe flange even if they are made from the same material. +/- 0.5mm is a good tolerance for most rubber based flange applications. What does +/- 0.5mm mean for my design? When RAM says +/- 0.5mm we mean that the part is cut within those dimensions and you should be able to say that the hole was nominally 12mm rather than being 11mm or 13mm. Add to that an error in obtaining the actual measurement and you have established that it is a part that will fit the flange and the bolts will go through and that when the bolts are tightened there is sufficient surface area to create the sealing pressure. Also, consider the size of the gasket. If its 2m in diameter, can you measure it within 3 or 4mm and if it’s rubber it will distort as it’s fitted anyway. Cutting to Metal Tolerances on a Drawing. Commonly drawing software the initial drawing template has a tolerance for metal parts. Many designers don’t remove them and subsequently buyers then request the tolerance on a quote. We advise them the tolerances can’t be reached and this article goes some way to explaining why. When tolerances are so wide they affect the design. Most commonly when measuring Manhole Gaskets on-site. Measuring a manway for a new gasket is a series of co-ordinate hole centres and these holes have a central tolerance. Often standard sizes, however, manway gaskets are commonly bolt punched on site, with tolerances that have a margin of error, a wide tolerance can substantially affect a dimension on bigger gaskets, as overall dimensions are bigger. The complete gasket is often flexible however when this poses a problem, prototype parts can be created and checked for fit before larger scale production commences. Adjusting part dimensions for accuracy. Accuracy is most often required when the space a gasket can fit in is small, also when surrounding materials are not strong and displacement mustn’t weaken the assembly. Softer material can be used to help; however, this can impact on the seal ability under pressure. When parts require accurate cutting we cut small volumes and test each measurement. There are so many variables that conformance is achieved through the CAD set-up and testing dimensions as they are cut. Conformance and reports can be provided if a gaskets dimensions are critical.